Here are a few shots of our L.A adventure all taken with my phone. My film will hopefully be developed next week and I will be sharing some of them then. It was so good to see my brother and sister in law. L.A was a really interesting city. Do not think I could ever live there, a bit too much time in the car for me. But there were some really cool things about it. I loved the amazing plant life. 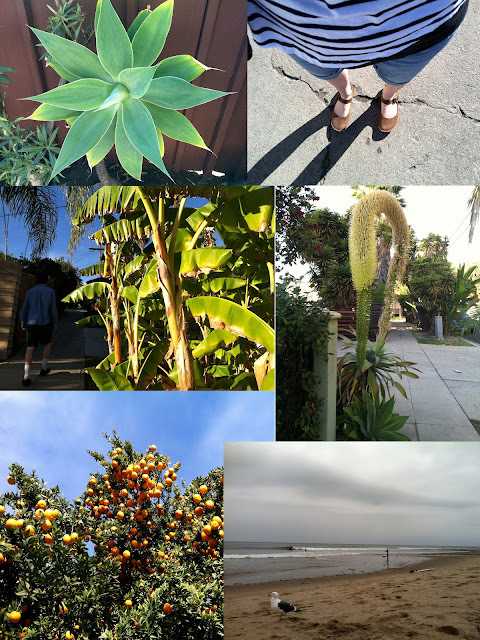 Wild groves of nasturtiums, so many succulents, luscious banana trees taking over the side walks. We ate so much good food. Tacos that tasted just like tacos off the street in Mexico made us so happy! We pretty much ate our way thru L.A. Being from Lopez going out is a pretty exciting thing for us. I wold say we go out to dinner maybe 1 time every 2 months. So being in a place with such an array of food was awesome. Oh and then beach it felt so good to see the big open ocean and pounding surf. It made me want to head to Mexico so bad. It was a perfect quick trip and that sunshine was so needed!